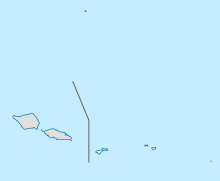 Fagali'i Airport (IATA: FGI, ICAO: NSFI) is an airport located Fagali'i, Samoa. Fagali'i Airport was previously owned and operated by Polynesian Airlines and the Samoan Government. Fagali'i airstrip - at one time a grass-only airstrip, was paved and reopened on 6 July 2002, only to be de-commissioned in January 2005 due to Government and village concerns over safety and noise. On 1 July 2009, Polynesian Airlines reopened Fagali'i airport and resumed a service that included international flights to Pago Pago, American Samoa. The reopening of the airport was controversial and attracted criticism both for the safety and environmental issues with the airport's configuration and for the potential burden on local communities should the scheme fail. ^ Sagapolutele, Fili. "Polynesian to resume flying into Fagali'i airport this week". Samoa News. SamoaNews.com. Archived from the original on 6 October 2011. Retrieved 11 June 2011. This page was last edited on 14 November 2017, at 00:04 (UTC).